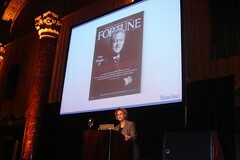 Time Inc. CEO Ann Moore covered a lot of ground in her early a.m. keynote at SIIA. One tidbit: Time Inc. is about to announce a partnership with Google that involves scanning the first 12 million photos from Life‘s archives. Not a lot of details yet. — Expanding Real Simple online will be a focus this year. — Next week People.com will launch a new celebrity database of 100 a-listers with over 2,000 content pieces and a promise that profiles will be updated in real time. Moore said returning the ad inventory to People.com nearly doubled CPMs. Moore pointed out that Time Warner has the top two sites in the gossip category; she attributes People.com’s status as #2 with monthly uniques to TMZ.com’s #1 to the latter’s presence on AOL and used other measures to show that People.com outperforms TMZ.com in some areas. Editorial buy-in: Several times Moore raised the notion that Time Inc.’s journalists are now on board with online. One reference to People: “The editors have drunk the KoolAid.” She also called the writes’ interest “one of the great breakthroughs,” offering SI’s Tom Verducci as an example. Haven’t failed enough: “You can’t fear failure. You try things, you learn from what works and you learn from what doesn’t.” Case in point: OfficePirates.com, which Moore said was doing well with 10 million page views a month but was never going to very big like SI.com big. (That would seem to have been pretty clear going in.) “I actually feel embarrassed that we haven’t failed more often at Time Inc. Standing out: this sounded almost retro — get people to make Time Inc.’s sites their favorite bookmarks in order to stand above the clutter. She brought up Google as an example: “Google weight loss this morning and you get 122 million hits … Some are good, some are bad, some could kill you.” (Sounds like a pitch for that Health site to me.) She didn’t mention search engine optimization or the like. Not too late: Time Inc. which to my way of thinking once had the chance to be cutting edge online, now has to prove it’s not too late to the party. Moore emphasized that it’s not too late; there’s still time for trusted brands to stake out their space in digital.